Mega Man's creator is making an action/RPG starring a pirate penguin. Is there some reason why you wouldn't play it? Keiji Inafune, best known for his work on the Mega Man, Resident Evil, and Onimusha series, isn't one to rest on his laurels. Even though Capcom has quashed many of his old projects, Inafune has been hard at work on a title for his new company, Intercept. 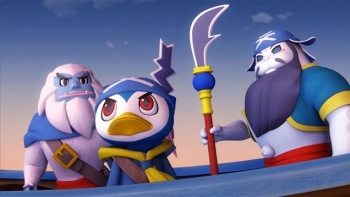 KAIO - King of Pirates -, an action/RPG for the 3DS, will tell the story of a young penguin who becomes part of a pirate crew. There, he encounters dragon archers, monkeys with staves, and a walrus with a beard in his quest to defeat the evil Leeos, a megalomaniacal lion. Seriously, if no part of that description piques your interest, gaming might not be the right hobby for you. The game's official site is already up and running, and Intercept has even provided an English translation of its content. More information comes by way of a trailer, which shows only pre-rendered footage but reveals some choice story details. KAIO appears to have all the necessary trappings of a pirate story, including cursed gold, sea serpents, and a yeti who can tear ships apart with lightning. Inafune himself has remained fairly tight-lipped about plot specifics, although he promises a "truly exciting gaming experience" in which "heroes fight for their ambition, justice, and their lives." Right now, KAIO is set for a 2012 release in Japan. Intercept has no specific plans for a Western release, although the English website and subtitled trailer are promising indications. Does the "Father of Mega Man" have what it takes to create another gaming icon? If a sword-wielding penguin in a bandana doesn't answer that question, I don't know what will.